30,000Km Service and costs over the year. €89.00 – 30,000 Km inspection. €71.20 – Mounting winter tyres on rims, balancing etc. €35.60 – Cleaning all 4 break callipers and greasing mechanism. €37.82 – Storage of summer tyres. This makes a total cost of €307.76 which is ok when you consider that includes a more work intensive tyre change. Our battery State of Health is at 100%, so no degradation despite probably 95% of the charging being rapid charges. In addition the inspection cost, we have had a total fuel cost of circa €450 over the 30,000Km. Our fully comprehensive insurance is relatively expensive at about €600. This works out at about 4 cents per Km (excluding cost of buying the car of course). 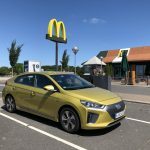 Judging by the prices I have seen for used Ioniq of a lower specification than ours, I would estimate depreciation has been about €2000 over the year. The Ioniq is currently in such high demand that the values are not really dropping much. I have even seen some offered for sale, and sold, at more than the original purchase price. So all in all we are very happy about our EV and do not regret it for one moment. eRuda, or elektrisch Rund um den Ammersee, is the biggest meeting of EV drivers in Germany, and this year there was something like 270 EV registered to take part over the 3 day event. I had been looking forward to this since the spring. The meeting place was in Weilheim on the Friday 5th October. On arrival, we were not greeted or directed to park in any specific place, which surprised me as we had registered as part of a team. The first event we were due to take part in had already left a few minutes before we arrived, and so we were told just to make our own way to the destination. On arrival, we waited a long time, looking for other people taking part before eventually we found them. The presentation about the village of Wildpoldsried was interesting however. In the evening there was a briefing for the next days “challenge”, followed by a presentation by Otto Schönbach who drove in a Twizzy from Munich to Nordkap. What a crazy trip! Saturday we arrived early so we could be in the group leaving by 8:30. We had expected a start photo and to be registered as setting off. There were a couple of people standing around, and on enquiry we were told just to set off. 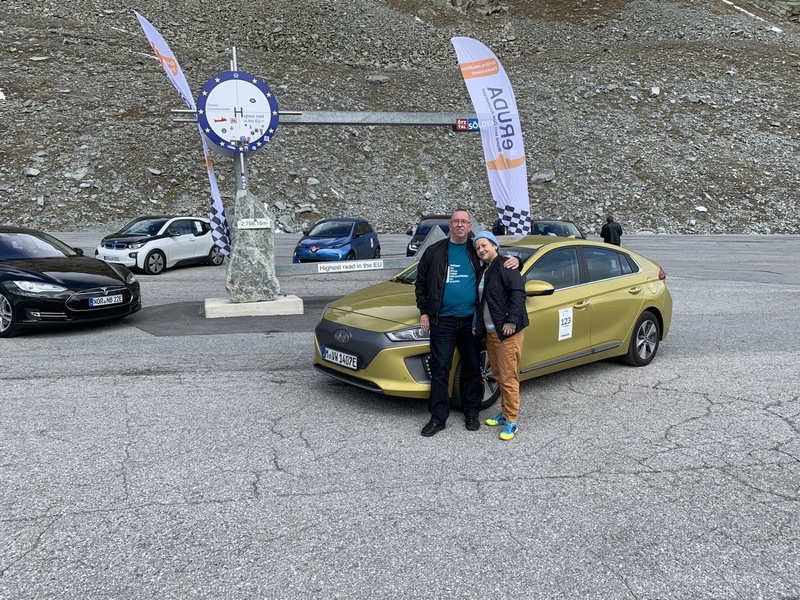 The “challenge” was to get to the top of the glassier road, Rettenbachferner, the highest road in the EU. I didn’t find it that much of a challenge. I had expected the pass to be steeper. We saw a few other EV who were attempting it without recharging, by driving very slow, and thus causing a lot of tailbacks. I don’t think slow driving EVs really promote their adoption. 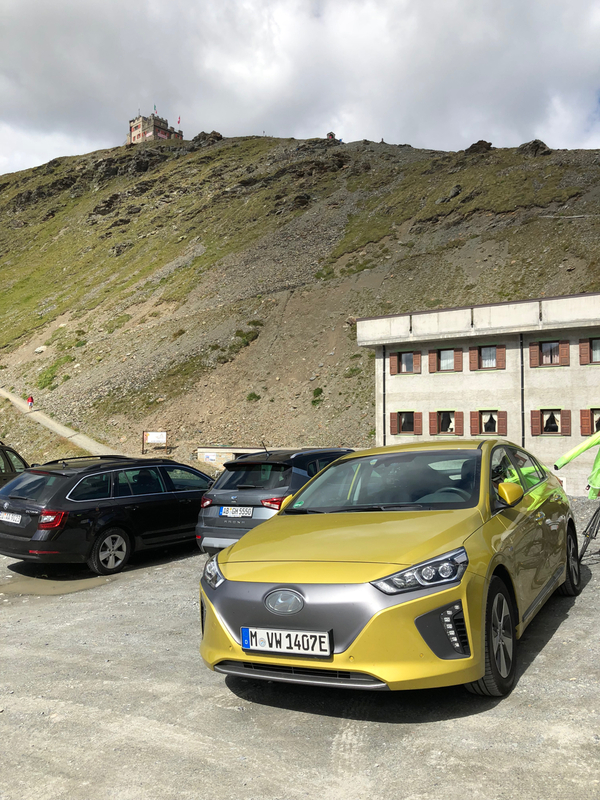 Anyway, we arrived at the top of the mountain with something like 50% charge after having a recharge some 10Km before the start of the Ötztal. On arriving at the checkin point we were given the sticker, and that was that. We then had to head back to Landsberg am Lech. The instructions on the briefing said to goto one specific address, but it was incorrect. We actually had to goto the town centre. Once we arrived there, they asked why we were not on the leavers list, the list we were looking for when we left in the morning. However they stamped the back of our sticker with the arrival stamp and we parked up. Up to this point we had only seen 2 other members of our team. I felt the whole eRuda was chaotic and not well organised. So we didn’t bother going to the Sunday events. I can not see myself taking part again. It sort of a tradition that we take all our cars up to the top of the Stelvio pass during the first summer that we have them. 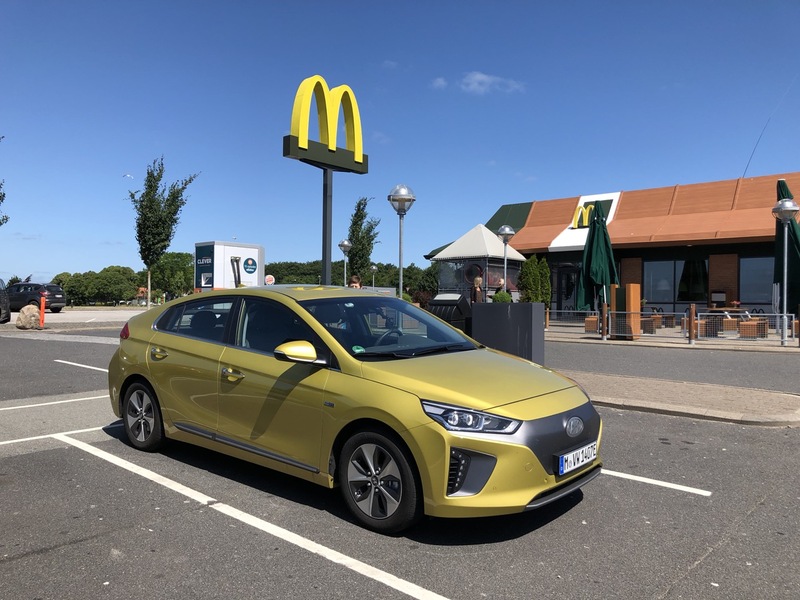 For the Ioniq, this was delayed a few times, but at last it was now time to do the trip. We left Munich at about 8am with 80% or so charge and headed down the A95 towards Garmisch. I had it in mind there was a rapid charger at and A.T.U. between Garmisch and Lermos so when we arrived at the A.T.U. and found no charger I was confused and a bit worried, as I now only had about 20Km range. Our only option was to return to Garmisch and plug into a 22kW type 2 from New Motion. I am certain it is not a 22Kw connection, as the car told me it would take 8 hours to charge. This would suggest the charger was only providing about 4kW I think. After an hour we had an increase of 18Km. We decided to continue to Lermos where we charged for another 30 minutes and had an increase of 25Km. 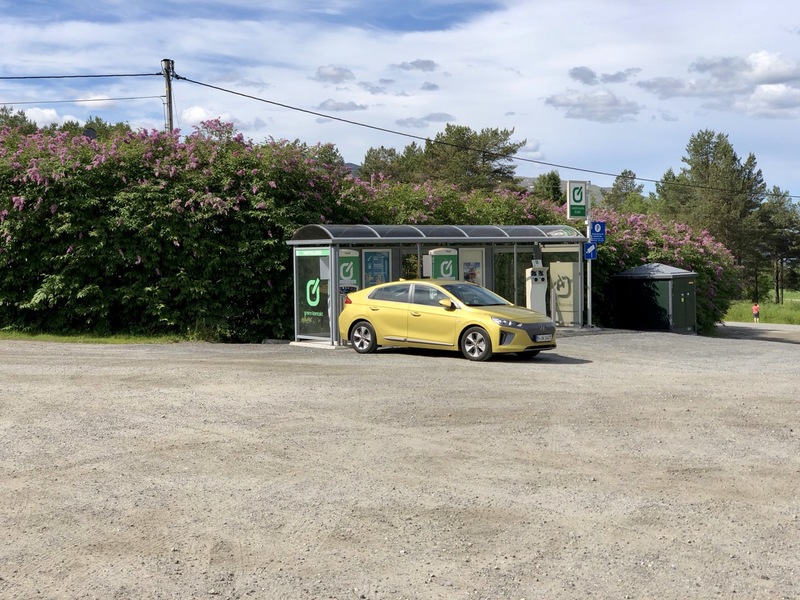 This gave us enough range to get to the Ella rapid charger at Karrösten. it was now 12:30. I had imagined we would have been at Stelvio by this time. 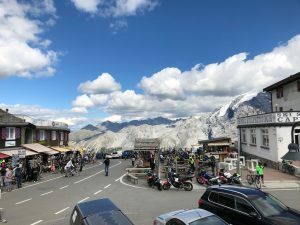 The drive up the Stelvio is not recommended for new drivers or people who are not confident. Its narrow with a lot of kamikaze motorcyclists going way to fast around blind bends and cutting the corners of the hairpin bends. Going up the mountain I had several occasions where I had to stop because of this and because of other cars coming down the hill that refused to give way on narrow stages. I was always taught that those coming uphill have priority unless otherwise signed, this doesn’t appear to be the case in Italy. From our initial 110Km at the foot of the pass, by the time we were half way up, we were down to 40Km. by the last 5 turns I was at two bars on the battery meter, and I had doubts we would make the top. On reaching the top we had 8Km range left and of course there are no chargers or even 240V power points anywhere to be seen. We parked up and went for a pizza, and asked the owner if there was anywhere to plug in. As expected the answer was no. I didn’t really enjoy the pizza for some reason. The top of Stelvio is a mess of parked bikes and tourist trap stores. We didn’t look at any. I usually enjoy the view from the top, and usually spend a bit of time looking at the stores, but today I was very worried about how we would get the 40Km+ to the next charger. Isn’t regenerative breaking a great thing? On restarting the car and leaving the parking place we had 7Km range. using a combination of regeneration step 1 & 2 we dropped the 16Km long 2000 meter drop, 48 hairpin bed road and recovered to 62Km in range. in addition we used no power at all actually going down the road, effectively we had 71Km of fuel free travel. We headed to the closest rapid charger at Lasa. There were conflicting reports about the status of this rapid charger. One said it had been removed and was being upgraded, another said it was getting the price info and that it was all ok and operational. The former proved to be correct. The charge point has gone. So we continued onto Silandro and charged there instead. The RFID cards proved to be an issue. Maingau/ESL was refused, as was Ella, SWM, Hyundai/enbw, Smatrics, and Chargemap. It finally worked with Plug Surfing. The next stop was Brenner. No issues there. For the Tesla owners, the supercharger has been expanded to 16 bays, and the CCS charger has been moved along 2 bays. There are 2 empty concrete bases, so it looks as if extra CCS may soon be installed. The type 2 charger has also been moved over and replaced with another type I think.The rest of the trip from Brenner to Munich went without any real issue, except an SUV/Tank trying to run me off the road at the Brenner bridge video toll gate. We arrived back in Munich at around 11:00pm with 90Km range left. The total distance was some 650Km. I didn’t record the kWh/100Km. My wife’s family live between Le Man’s & Tours in West France, so we drive there a couple of times a year. This journey was the one thing that was putting me off getting an EV. The charging structure in Sartre is really bad. My impression of charging generally in France was not positive. There are plenty if type 2, lots of type 3c, but not so many CCS ( or CHAdeMO for that matter). I has searched all the charging apps for CCS on the route I take from Munich for many many hours and came to the conclusion that it would be difficult to make the trip. 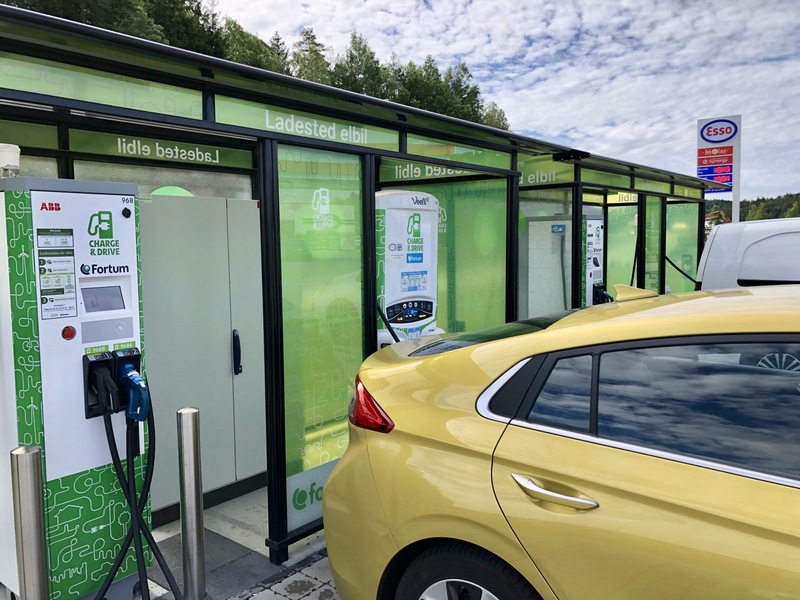 Between Auxerre and Tours a distance of about 300km there was no rapid chargers that are operational. There was an option via Paris which I hate, but again the last 300km has only 1 rapid charger, and if that is broken there is no fallback. The other, preferred, optional route has a charger at a LIDL that according to Chargemap has been out of order since last November. I sent a series of emails to LIDL France and the emphatically stayed the charger us operational. Using this route I could probably reach my in-laws without a great problem. Once we get there we would have to use the granny charger at it’s low power setting. My in-laws only have a 6.6kW supply into the property! We have for many years now split the drive over 2 days. First to Beaune, and then the rest, so this time was not going to be different. I booked a room at the Mercure Beaune Centre hotel partially because of its location and partially because it has chargers. Most of the chargers were Tesla Superchargers, but they had one charger with Type 2, Type 3c and 2 pin 240V sockets. On arrival, and plugging into the type 2 we discovered the charger wasn’t compatible with the the Ioniq for some reason. We kept getting “Charger Error” displayed in the Ioniq, and the charger never started charging. We reported this to the hotel, but they couldn’t do anything as the maintenance people had left for the day. So we had to charge with the granny charger. The hotel did say they would get the maintenance guys to look into it on Monday. The following day we drove via Chateau Chinon-Ville, and as expected the Lidl charger was out of action. It was powered off, and covered in cobwebs. So much for the assurance from Lidl that the point was functional. My plan B was to charge at Magny Cours, and that was a faster charger and fully functional. 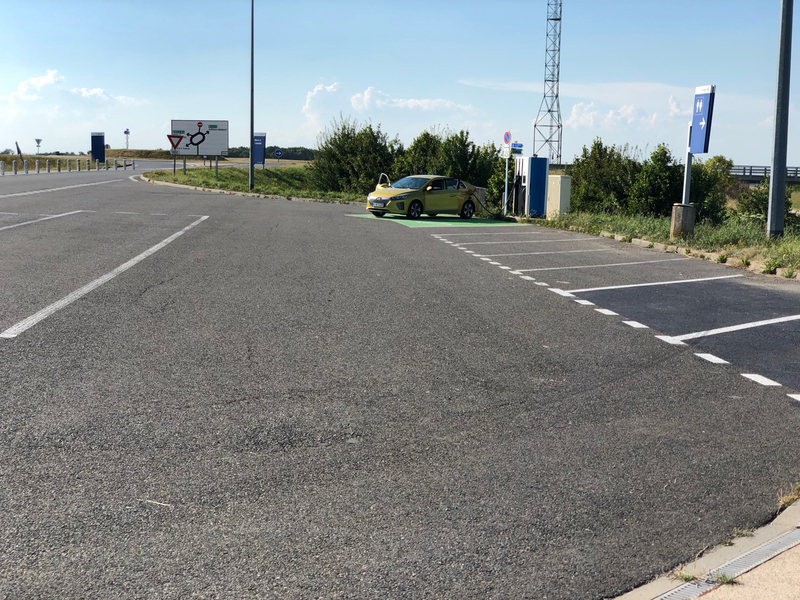 The rest of the trip to the in-laws was uneventful really, except we discovered a new rapid charger at Neuillé-Pont-Pierre on the A28 (at the exit after the toll booth, which is about 35Km from our final destination. This was excellent as it meant we didn’t have to load down my in-laws house with our granny charger. My in-laws house is only provided with a 6kW electricity supply as it is in the middle of nowhere and they have only a few fridges and thats about it. During our stay we topped up a few times at the local supermarket on a type 2, and on a day trip we failed to charge at a type 2 at Montreuil-Bellay. The charger had 2 type 2 sockets. one was in use by a Tesla and they were charging, but the second socket gave us the same error as at the hotel. It did finally say it was charging, but it terminated about 2 minutes after we left, resulting in a bill for 45 minutes charging for 0.01kW. I successfully challenged the bill later. The return trip we did a bit differently. We headed along the A10 towards Orleans, charging at Villerbon which is finally in operation, and then cross country to Charny. In the car park of the supermarket we found a type 2 socket which we plugged into whilst we had a very nice lunch at a local restaurant. Much to my surprise the Maingau/ESL card worked here. We increased out charge by 35%. After lunch we continued to the Autoroute A8 at Sépeaux where there is a rapid charger. 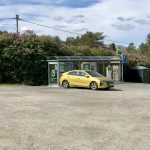 Unfortunately this charger is not yet in operation, o we had to continue across country to Aillant-sur-Tholon which is a really small town that has a rapid charger next to the church. On arrival there was a Zoe which was just finishing its charge, so a short wait of 5 minutes was on the cards. 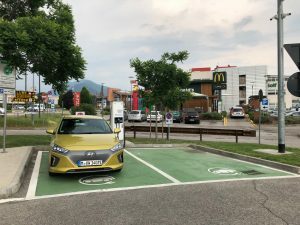 This was the first time we had to wait for a charger during this trip, but half an hour later we were fully charged and on our way again via the A8 to Beaune and back to the Mercure Beaune Centre hotel. At the hotel, the type 2 charger still wasn’t operational, and again the technician wasn’t available. The hotel received a written feedback on this when I received their satisfaction survey. Anyway, we charged again overnight on the “granny charger” and continued the next day in the direction Mulhouse and Germany. In Germany I also wanted to try a different route. For some reason in the south west of Germany chargers are few and far between except on the Autobahn. Just before Freiburg we charged on the motorway to 94% and then headed to Tuttlingen. According to the apps there was a rapid charger at the VW dealership which may or my not be operational, depending which app you look at. otherwise, there are a few type 2 around. On arrival at the VW dealer, the road was dug up and it was not possible to access the dealership. At least so it appeared. I parked close by and took a walk around, eventually asking someone on a bike in the forecourt. The dealership had an access via a back road, so we were able to reach the charger and get fully charged again. I had planned a stop at Memmingen but the rapid charger there is broken, and has been for a couple of months. The CCS doesn’t recognise any vehicles. 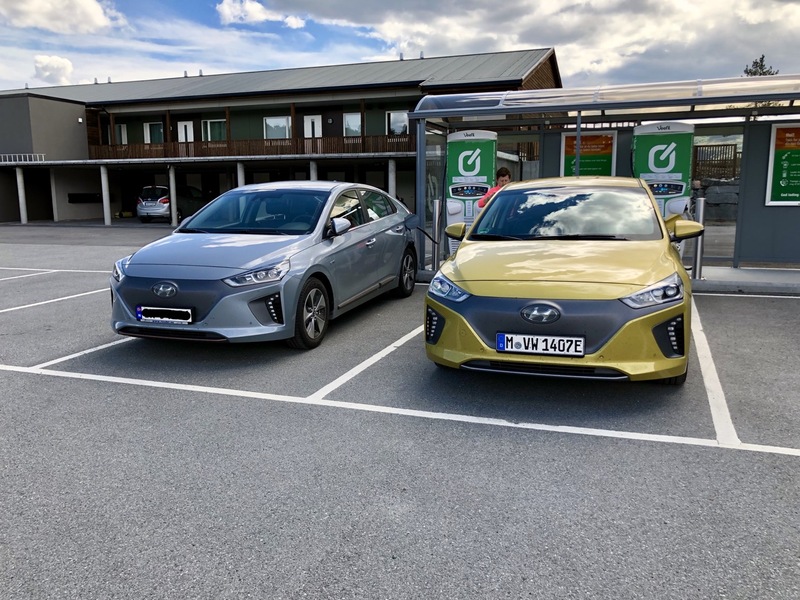 As our charge level was getting a bit low, i need a charge so our next stop was at Autohaus Sangl, where we originally purchased our Ioniq. There there is a free 20Kw CCS. On arrival the park bay was blocked by an i3 that had stretched its charge cable over to a type 2 charger in the next (and empty) parking bay. My only options were to park on the pavement or block the entrance to the parking. I chose the former and no sooner had I plugged in that I was verbally assaulted by an older couple for blocking the pavement and received threats that they would call the police and get me towed away. Whilst they were technically in the right, the way they spoke to me telling me “in Germany we obey the law, which obviously isn’t the case where you come from” was out of order. 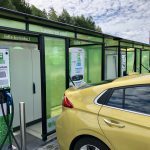 After I calmly explained to them why I was there, and explained that I was unable to drive further unless I charged as this was the equivalent of a petrol station for me, they calmed down and we had a chat about range and charging duration. They went on their way and I finished my charge. We arrived home an hour or so later, tired but happy. 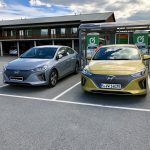 When we bought the Ioniq, we almost jokingly said we now had an excuse to goto Norway, to test out the charging network. A few weeks later we decided we would drive there. Neither of us had ever been to Scandinavia, so it would be a total adventure for us. In advance I obtained charge cards from Fortum Charge&drive and Grønn Kontakt for Norway and Clever for Denmark & Sweden. Additionally, I registered for a toll transponder and registered with Toll Collect so we could use the toll roads free of charge. 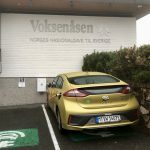 I also watched many many hours of YouTube videos about Norway, and of course TeslaBjørns road-trips to get an idea of where to go and how charging is. Of course a route needed to be considered, but nothing fixed was planned. 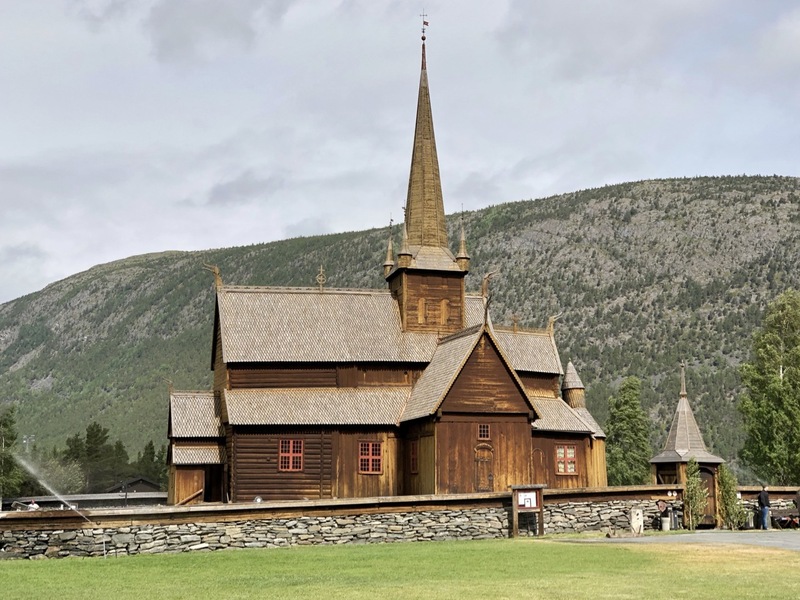 My initial thoughts, once we arrived at Oslo was to go south via Kristensand , around the coast to Stavanger, then up to Bergen, onwards over Trollstigen, the Atlantic Road and onto Trondheim. Then if time and funds allowed further north maybe to Lofoten, before returning direct to Oslo. 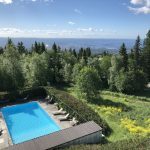 My wife had been keeping an eye on the weather in Norway for a month before we went on holiday, and they had a heat wave of 30C. She was happy. Accommodation was not even considered at this point, but I already had concerns about the cost of hotels. As we know however, the best laid plans of mice and men so often go astray. so its better not to plan too much! I suffer from back problems, and the week before the trip, the pain was so bad it threatened to cause a cancellation of the trip. I spent the best part of the week pumping myself full of pain killers which helped, but come Saturday, I felt I could not travel so we had to stay at home. Sunday was a bit better, but I was still not fit for a long drive. Monday morning I decided it was ok, and we set off around 10am. I wont go into all the details of the trip as a lot is not so interesting to tell. We headed in the direction of Berlin. We had one issue on the first day of a charge being out of order, and thus had to backtrack and goto a BMW dealer in Lauf an der Pregnitz. We had charged at the dealer before and just like the first time, the offered us a coffee whilst we charged. Thats service. As we take it easy whilst driving, and enjoy the drive as part of the trip, by the late afternoon we reached Spandau and spent the night there. After a relaxed breakfast, we continued onto Lübeck and spent a couple of hours looking around the town. Certainly a place to return to sometime. On the way there we stopped at a recharging point on the motorway and as so often happens we were bombarded by questions about the EV and infrastructure. After leaving Lübeck we headed to wards Flensburg. We didn’t get that far but in the late afternoon checked into a hotel run by a nice Russian guy in Rendsburg. He was interested in our journey and was surprised we were in an EV. I suggest to him that he should get a charge point or two, and mentioned that he could get a couple of destination chargers via Tesla, which he said he would look into. The route continued via a VW dealer in Flensburg, where we could recharge for free. Whilst waiting I thought it would be nice to look at an e-Golf. Of course they didn’t have one, and the dealer told be that it was not possible to order the e-Golf as it was no longer being made, and I should consider a GTI. I don’t know if it’s true that the e-Golf is no longer in production, but if it is, then it really shows just how uncommitted VW is to the EV platform, and calls into question if the concepts they have been showing will ever be made. After Flensburg we crossed over into Denmark. The total cost of the recharging for Munich Flensburg was a wapping €1,50! In Denmark I really wanted to goto Copenhagen. when searching booking.com, we couldn’t find any accommodation under €800 per night. So we parked up for 2 hours, visited the little mermaid after fighting our way through a bus load of Chinese tourists, and took a few photos. back into the city, had a coffee and left. The next road took us through the tunnel and over the bridge to Malmö. I was not impressed with Malmö. The bits we saw were just ugly. Also getting a charge was an issue as the e-on charger just wouldn’t work. I kept getting an error that said the car requested too much power. After 4 or 5 attempts I gave up and went to a circle K, where the charger worked at once without any problems. After a charge and a coffee and enjoying a very nice evening sunshine, we continued up to the sleepy town of Landeskrona, the home of Tycho Brahe. The hotel in Landeskrona had only 4 rooms and a shared bathroom, so breakfast was in a local bakery. 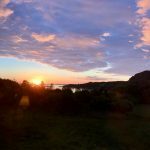 The morning was chilly, and as we continued north to Gothenburg or started to rain a bit. Not much but enough to annoy. The temperature was also sinking, so when we reached Gothenburg it was windy and cold. We had a walk around for a while and had a meal. I didn’t want to stop very long here as I wanted to reach Oslo if possible. So after a couple of hours or so we were back on the road. The motorway up the coast is a bit boring and really not much to see. We reached the border with Norway about 5pm or so, and the heavens opened reducing visibility to next to nothing. What a welcome! by the time we reached our hotel in Oslo, which we booked at a stop a bit earlier, the weather was a bit better but still very cloudy and rainy. 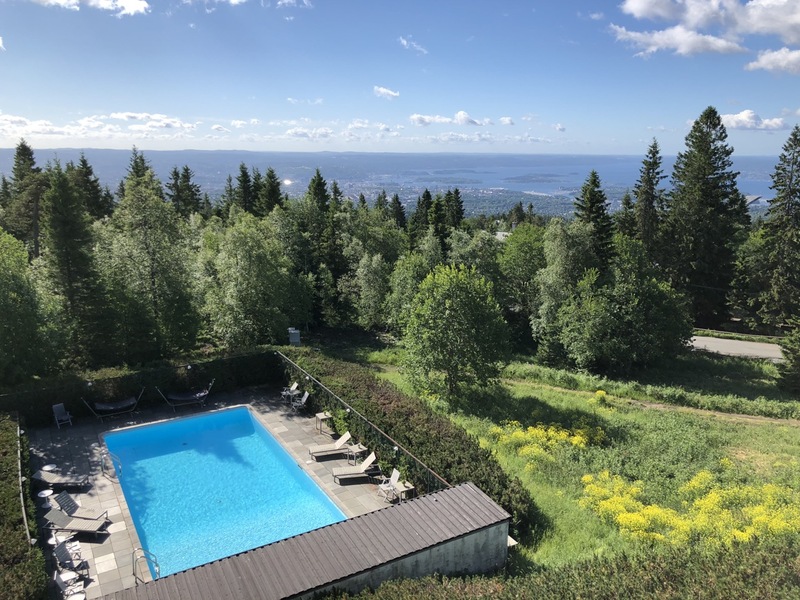 The only hotel we could find at an affordable price was about 6km outside of Oslo, a hostel, up in the hills with “a fantastic view across Oslo”. Not when we arrived though as it was in the middle of a cloud. We arrived about 8pm and had only a few minutes to get into our room before the restaurant closed at 8:30pm. The food was terrible, cold and expensive. Today the weather was much better and we had a wonderful view across the bay. 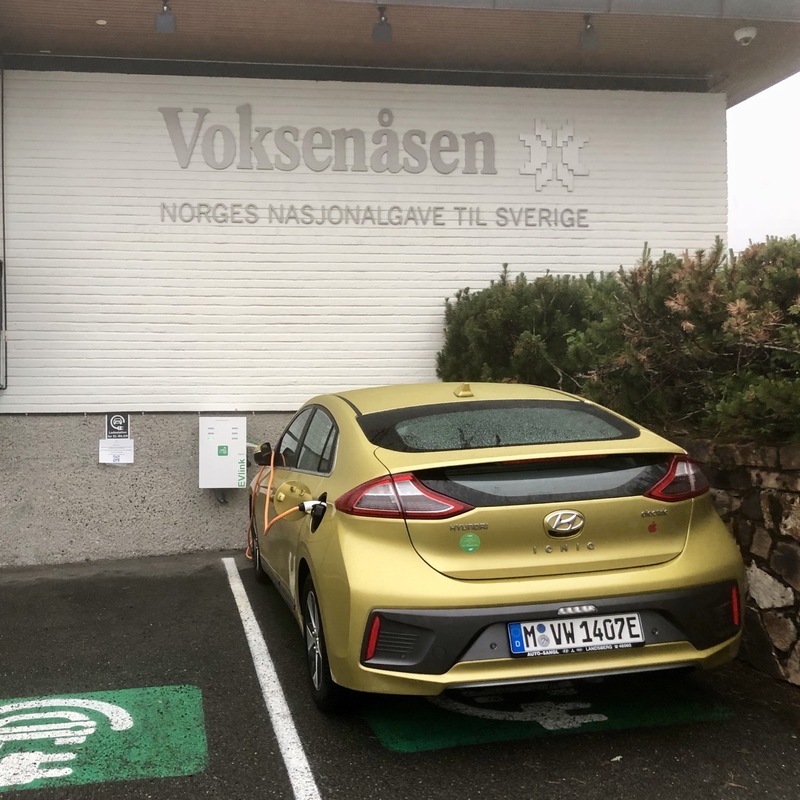 In Oslo we visited one of the EV only parking places inside an ancient fort. It was very narrow. The parking had places for 100EV, but there was no place available. 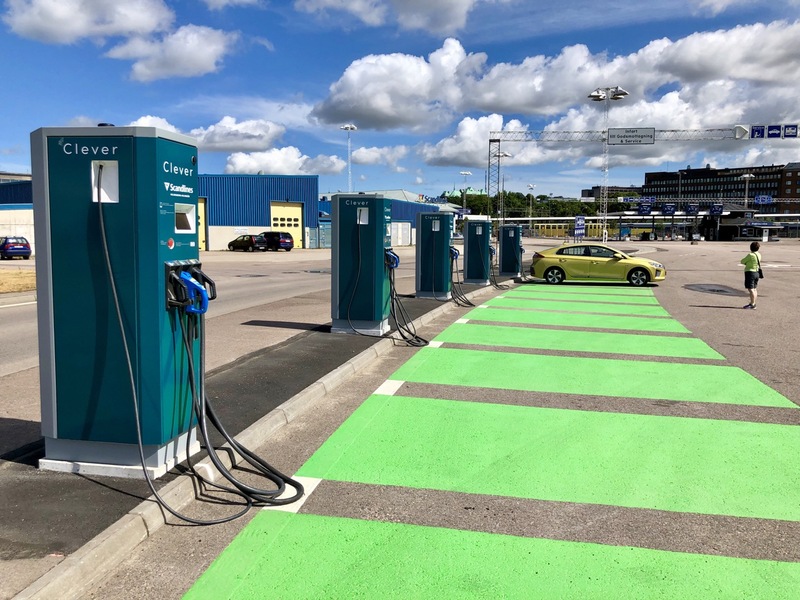 The number of EV in Oslo is incredible. Our time in the city was way too short, and its a place I would like to do a fly stay sometime. We needed now to decide how we were going to proceed, either go clockwise or anti clockwise along the coast. We decided Anti Clockwise, so set off for Trondheim. We made a stop at Nebbenes to look at the Tesla Supercharger station which has something like 30 chargers, and have a recharge ourselves. The station is really impressive. By the evening we were in Trondheim and checked into a Summer hotel run by students for 2 nights. The rest of the year the hotel is student accommodation, and it reminded me of my accommodation in military barracks. In the evening we had a nice meal in a sort of pub restaurant. We walked around Trondheim a bit, the town has its nice points. Whilst walking around we charged the car in an underground garage for which we were never billed. During the afternoon we made a short north to Levanger, the most northerly point on our trip. 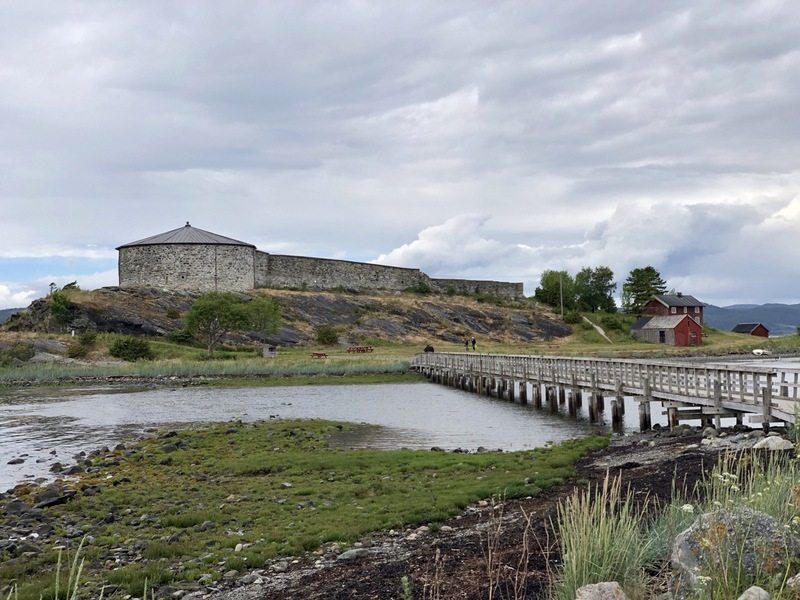 We found an old fort at Skatval, which unfortunately was closed, but I did manage to get to fly my drone in the area for a few minutes and peeked over the walls. In the evening we had an Indian in a sort of take away place. The portions were very large, it was cheap (for Norway), but I didn’t enjoy it really. After leaving Trondheim we headed for the Atlantic Road. The weather started cold and rainy, but as the morning progressed, the weather improved. 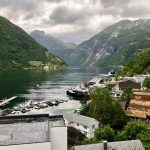 We passed by many small villages and some very beautiful fjords. Even relatively in the middle of no where we found charging stations with multiple rapid chargers. When we reached the tollbooth for the Atlantic road I asked if there was a discount for an EV and was told for EVs it was free of charge. This was one of 2 times that we had a reduction. The other being on a ferry where I only had to pay for my wife, the EV and myself being free. All other ferries we were told the discounts had been stopped. The Atlantic road, whilst short, is a nice drive. There are a few places where its possible to pull over and go for a short walk, but it was raining again and extremely windy. I had a drone with me, that I bought specifically to film the road a bit from over the sea, but the weather was just too bad to attempt a flight. 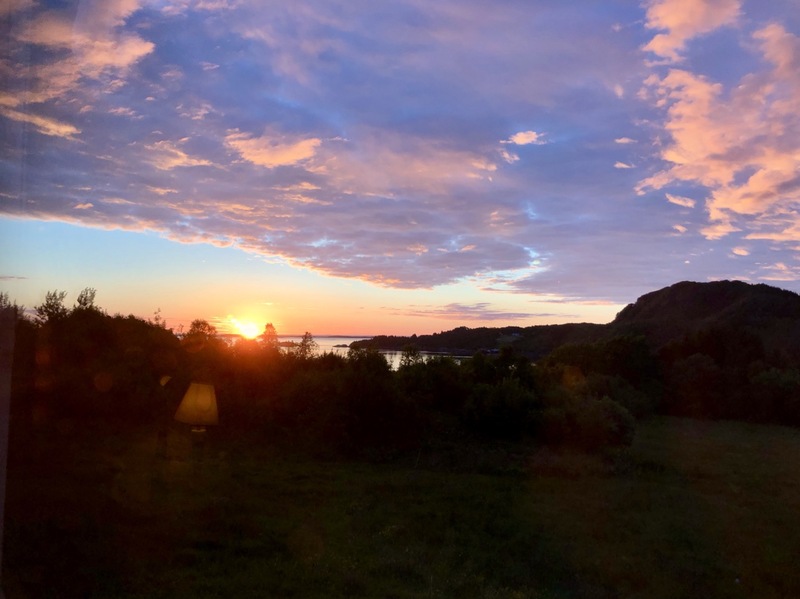 As for accommodation, we booked first a tiny house, and got a confirmation, but the owner phoned us and told us he was booked out, and we would have to cancel it over the website. His cancellation policy meant we would lose the cost of the room, which annoyed me. It took a good week for booking.com to refund the payment. We ended up in a house in the middle of nowhere which had about 5 or 6 rooms, a shared lounge and kitchen. The closest restaurant was about 12km away, a rather bad pizza place. 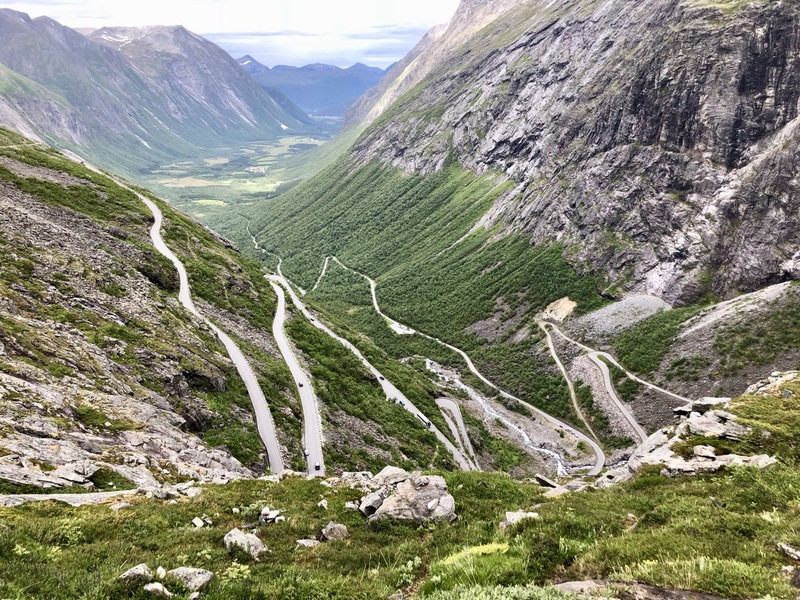 The highlight of the day, and the trip, was to be Trollstigen. We left the accommodation about 9 and soon thereafter the rain started again. At some of the ferry crossings we could hardly see the ferry docking due to the rain. 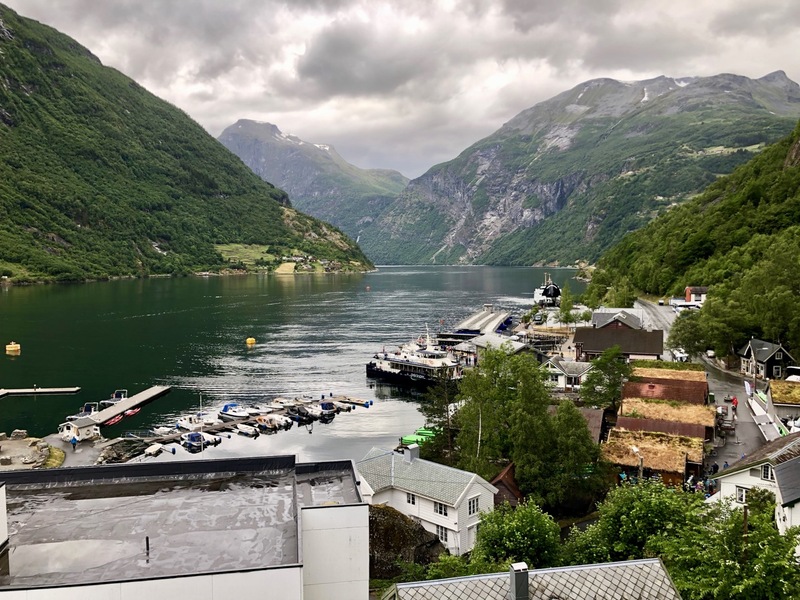 By the time we reached Åndalsnes, and time to charge the car, the rain had eased a bit, so we had an hour to look around and buy a few presents for our cat sitter. 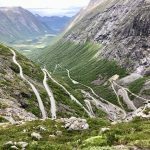 We made our way to the foot of Trollstigen with patchy drizzle. Luckily as we went up the pass it wasn’t raining so we could see its beauty without being stuck in a cloud. I love driving mountain passes, and this one is not difficult at all. Sometimes its a bit narrow however and you do have to make room for the coaches that are shuttling tourists around. I think this would be more of an issue for people in motorhomes. At the top of the pass is the obligatory souvenir shop and cafe, but also a nice walk to lookout platforms over the road. Well, it would be nice it it was sunny, but once again it was drizzling, very windy and very very cold. Still, despite this, it was the highlight of the trip for me. We continued along the road past some very nice waterfalls and landscape to Geiranger, where again it poured down without pause. One of the things that impressed me here was the number of charging stations for of all things Twizzys that can be rented. We must have seen at least 50 that were charging, and at the fast charger there were again a very large number (40 or more) of type 2 and 2 pin sockets. Geiranger its self is very forgettable it it wasn’t for the fjord. I had wanted to take a boat to see the 7 sister waterfalls, but there were no boats running. Overnight the rain didn’t stop, and I saw a sign saying the road was closed due to the weather, but there was no indication if the sign was up to date or not. The hotel receptionist said the road was open but could be slippery. Our target for the day was going to be Bergen but this didn’t happen. As we went up the hill the weather got worse and worse, the temperature dropped to 2c and then it started to snow. I was not equipped for winter weather, and I was not really happy about driving for hours on end in rain where I can hardly see anything. For this reason I also have no photos from this area of the trip. Checking the weather forecast for the next few days showed that there was no improvement in sight, in fact the rain was forecast to get worse. So the decision was made to head home. We changed direction and headed to Hønefoss. 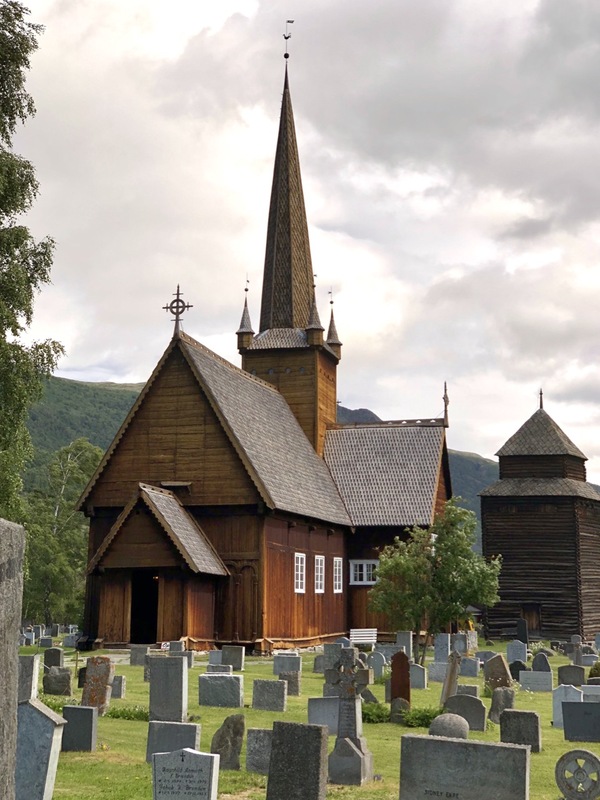 One thing we still wanted to see was some stave churches. We had seen one or two on the way, but they were all locked, so we planned the way back so we had a chance to see some more, and hopefully find one open. The one at Lillehammer was closed when we got there as was one other which was closed due to a funeral. We did find one at Vågåmo which is also the home of the artist Munch. 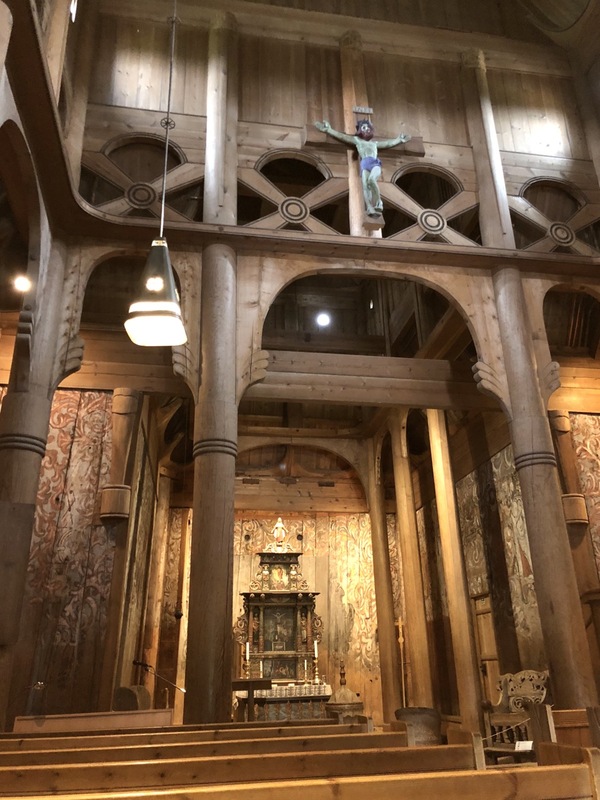 The interior was very beautiful, but it was quite small. Our hotel at Hønefoss had a few EV charging points, but it turned out these were normal 2 pin sockets. 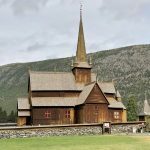 In the online forums, it was said the EU ICCB would not work in Norway because of a different earthing system. There is actually a different ICCB version delivered in Norway. I decided to try mine anyway as I was there and at least see for myself what the error would look like. Much to my surprise my ICCB worked perfectly, and in the morning I had 100% charge. I have no idea why this worked, as its well known that usually they don’t work, and other brands like Juice Booster 2, Go-eCharge, and NRGkick, have a Norway mode. 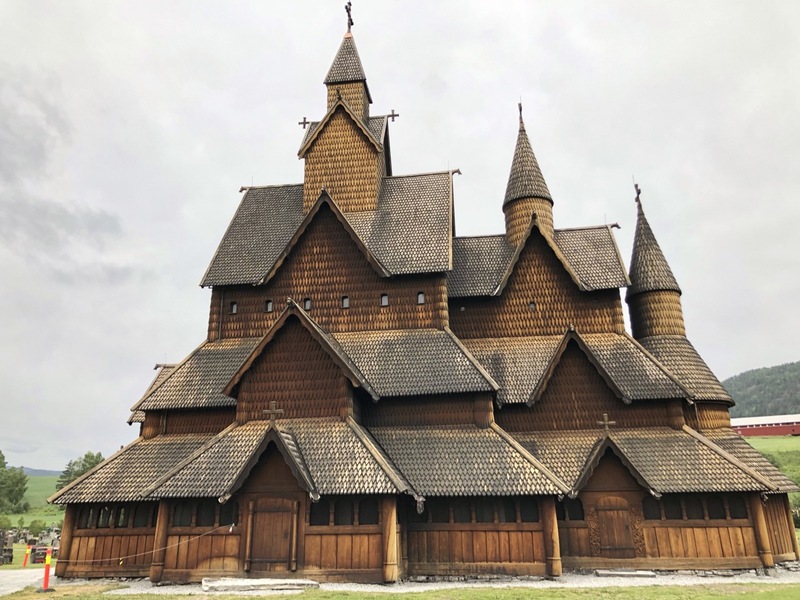 Today was to be our last chance to see the inside of a Stave church, and the largest one in Norway, at Heddal. It was about 2 hours drive from Hønefoss, but it was worth it. 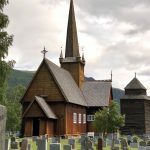 The church is very interesting and has a lot of historical interest, and even some ancient rune graffiti which is only partially translated. 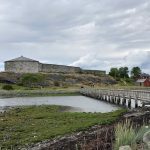 We had to backtrack towards Oslo and took the tunnel under the fjord to get back onto the road to Sweden, stopping for the night at Fredrikstad. We asked the very nice receptionist to recommend a good restaurant where we could get real Norwegian food, as we had only had Norwegian once. She told us there was one in the town and we went to the place she stated, to find out it was a burger grill. Not what we wanted, so we ended up going to a Greek. As it turns out, the brother of the owner, has a restaurant on Crete, in the village next to where we have a house! I have merged these days together as there is nothing of interest to speak about really. In Sweden we stoped for lunch in IKEA, which was just like at home. The only chargers at the IKEA in Uddevalle were 2Kw and on returning to the car the rain was so heavily that the cable was sitting in 1cm of rain water. We did have a tail wind most of the way which meant we have a good kWh/100km. By the time we reached our hotel in Halmstad on Day 11 the weather was getting better.Day 12 we took the ferry from Helsingborg to Elsinore in Denmark. The trip is quiet sort, basically long enough for a coffee, a cake and 10 minutes to look at the shop. We continued via the pretty little town of Roskilde, the name reminded me of a place in Scotland. From there we continued across the belt road and back towards Germany staying at Taulov in a rather run down Best Western hotel. Our return into Germany was marked by a drastic reduction of charge points. Hamburg was hell to drive past due to closed roads and traffic jams. We wanted to charge in Celle, there was one “rapid” charger which was blocked by a local Tesla Model S 75D (?) plugged into the type 2 charge port. It had been connected 36 minutes and had taken 2kWh. The CCS would not start until the other charge session was completed. There was no indication of how long this would take. According to the ChargEV app there was another charger at Braunschweig which which we could reach with 20Km to spare. When we arrived we discovered that it was not compatible with any of our RFID cards and it needs a card from the local electricity company. Our hotel had no chargepoint of course. Cutting a long story short we managed to get a bit of a charge at the local DEKRA building with the new motion roaming and then whilst checking the ChargEV app again discovered and Audi/VW dealer about 8km away that had a rapid charger. We made it to the charger and got a charge to about 80% before giving up the charger to another Ioniq from Frankfurt that also needed a charge. A quick return to the Audi dealer to complete our charge before a very frustrating drive back to Munich. The charging infrastructure in Germany is very poor in comparison with Norway. We had to zigzag all over the place to find chargers which took a lot of time. We also had a couple of chargers that were not working. Very frustrating. Looking at the map now, and locations where i took photos I wonder how we came to have such an indirect route from Braunschweig. Some of it was certainly dictated by location of rapid chargers, but still, it was a strange track. At the end of our trip we had circa 64 charging sessions, covered 5756km and spent about 100€ total on electricity. Would I do the trip again? Yes. For Bergen and the coast I would probably go on a cruise, as the distances are large. If I was to go there again, I would want to go all the way to Nordkapp, maybe via Sweden. 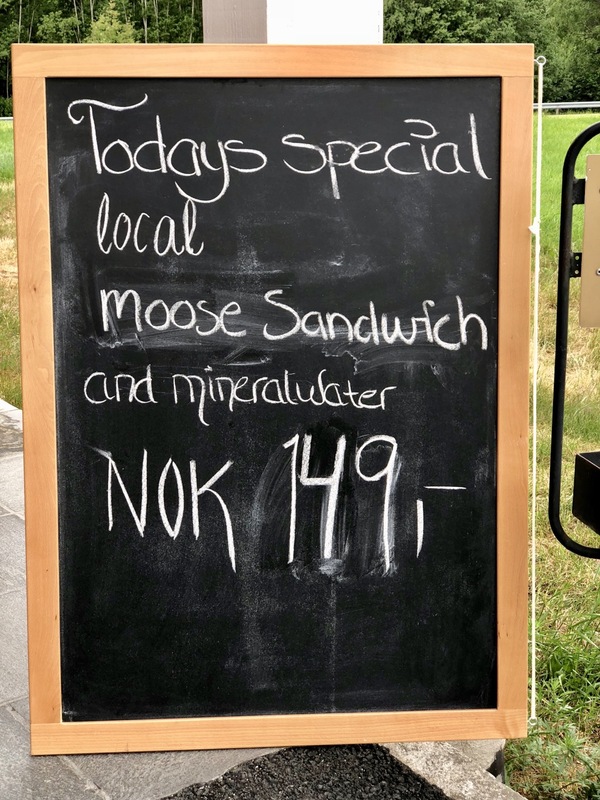 The costs in Norway for food is high, a pizza costs €18 and a sandwich is from about €8. On the other hand at circle K you can have a years supply of coffee in a circle K mug for 33€. Compared to Germany, accommodation the is also a bit more expensive with a cheap hotel starting at about €100 a night including breakfast buffet. if you want a better hotel you are looking at prices from €150. Our most expensive hotel was €185 which as the hotel at Geiranger. We booked for €150 via booking.com but the hotel increased the price when we checked in for exactly the same room. 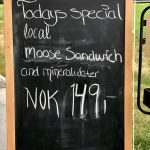 For my wife, her greatest disappointment was that we didn’t see any moose, except in a sandwich! 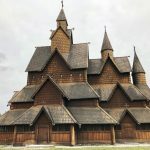 Our next (sort of) planned, trip will be in about 2 weeks to Norway. I have not actually made any plans, other than get a couple of charge cards and accounts for that area and get a toll road transponder. We have no idea where to go, but we wills stop at Copenhagen, and then drive over the bridge to Sweden. From there up the coast over Gothenburg to Oslo, and then….its open. I am thinking Trondheim, and then the Atlantic road, or maybe further north. I know we cant reach Nordkap, partially as there are no (?) 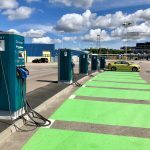 rapid chargers, and my Granny cable wont work in Norway, but also due to time/money. We will see where exactly we end up. One thing is for sure, it will all be new and interesting for us. 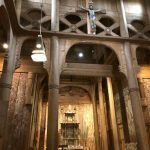 Recomendations on where to go are welcome! We went for a short drive today, only to the Bayerische Wald. We had wanted to try to get to Klatovy in the Czech Republic but as we approached the border the weather started to go grey and it started to rain, so we turned towards Zwiesel, where I have never been, but it was even worse rain there. So we came home again. We did try out a fast charger at Teisnach technology canter, but it was defective. However across the woad is the main office from E-Wald, and as luck would have it there was a guy in the garage there doing something with an electric VW Beetle. At that location there is also a rapid charger, which looks very temporary, so we asked if we could charge and they said yes. It was free which was good. Otherwise, a free charge at the BMW factory in Dingolfing, a short walk and free top up at Deggendorf was about all for the trip. Zwiesel might be a place to go back to one day to visit the glassworks perhaps. It was Whitsuntide and Whitsunday the weather was not good so the tour we had planned was postponed to Monday. At least it wasn’t so bad Monday, so it was down to the car and time for a tour. I wanted to try out a video camera in the car to record the drive as well, so first I spent a few minuted setting that up in the car. The plan was to go via Linderhof to the Namlos Tal. I had never heard of this place e, but it is not really so far away. The drive was easy of course, but my concern was where to charge. According to the apps I have, there are no rapid chargers in the area, only a couple of type 2, and I really don’t want to hang around in the middle of nowhere to charge for hours on end. So I chose the BMW hotel at Ammerwald where there is a free CCS. Its also a good place to stop for a coffee and the toilet. I arrived with about 43% charge, and the car told me I would need about 30 minutes to reach a full charge. Charge started timer on iPhone set and off to the hotel. 25 minutes later we returned to find the car had not charged. The charge had failed with a communication error after only 5 minutes. Annoying. Anyway,Chantal went for a short walk, and I stayed at the car and monitored the charge until it ended. It only took 15 minutes. The road is nice in this area, typical Austrian tan road with a nice lake to one side. It is not a fast road, but it is relaxing. We reached the Namlos Tal easily and had a pleasant drive along the valley. It is an attractive place only 10Km or so long. However, the number of crazy motorcyclists driving way to fast and often on the wrong side of the road spots it. The motorbikes also make it a very noisy place. Our charge level was very good, I don’t remember how high it was but the drive up to the top of the valley and the decent basically more or less cancelled out. So there was no need to look for a charger and we decided to have another pass, this time the Bschlabertal, also an unknown valley for me. The peak of the Bschlabertal is about 1900m I think. It is very bleak and there was still quiet a bit of snow off to the side of the road. The decent is quiet narrow and very windy, with an impressive view. As a driver you feel like your on a ledge on the side of the cliff. In addition there was also again a large number of mad motorcyclists risking their lives. Crash at those speeds on that road and you won’t live to tell the tale, you could easily end up smashed against the cliff or catapult over the railings and fall to your death. After the Bschlabertal We decided to start home as the weather was deteriorating. First we needed to get a quick top up, from 65% to make it home. We went to a charger at Ötztal-Bahnhof and used the Maingau charge card where we fully charged in about 15 minutes. We returned home via Mittenwald and the Kochelsee. This was a mistake as we had a 45 minute delay due to traffic at Kochel. Something I also noticed is that the navigation in the Ioniq is sometimes very strange on its routing algorithm. I had selected Fastest route no motorway, expecting it to put me more or less parallel to the Munich autobahn, but instead of heading toward Munich, it took me due east and then north, brining me into Munich from the south east. We were originally south west of Munich, and there is a nice fast road which goes most of the way. The route it took was through a lot of winding side roads. Very strange. Romeo, Romeo, therefor art thou Romeo? Or to put it another way, lets goto Verona! 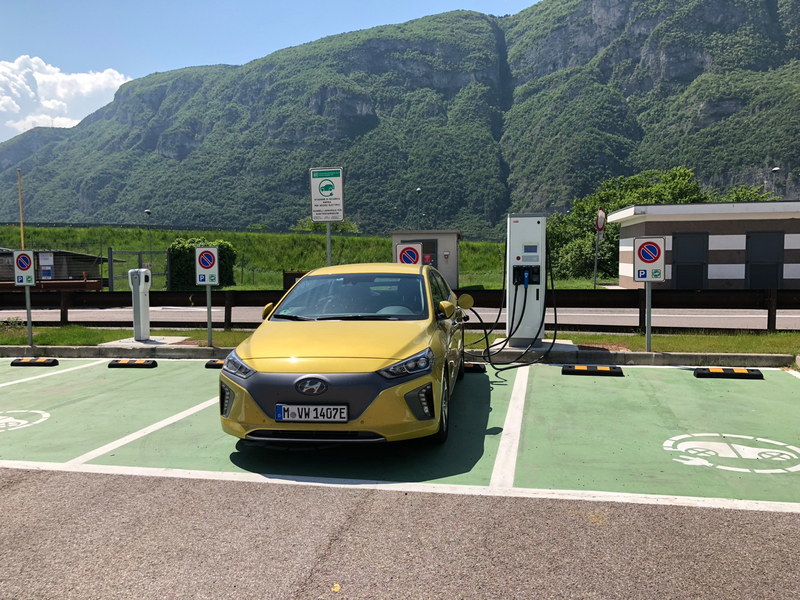 Italy has been outside my comfort zone when it comes to using my Ioniq Electric. To understand why we need to go back a couple of years to the time when we were first considering the possibility of going electric. 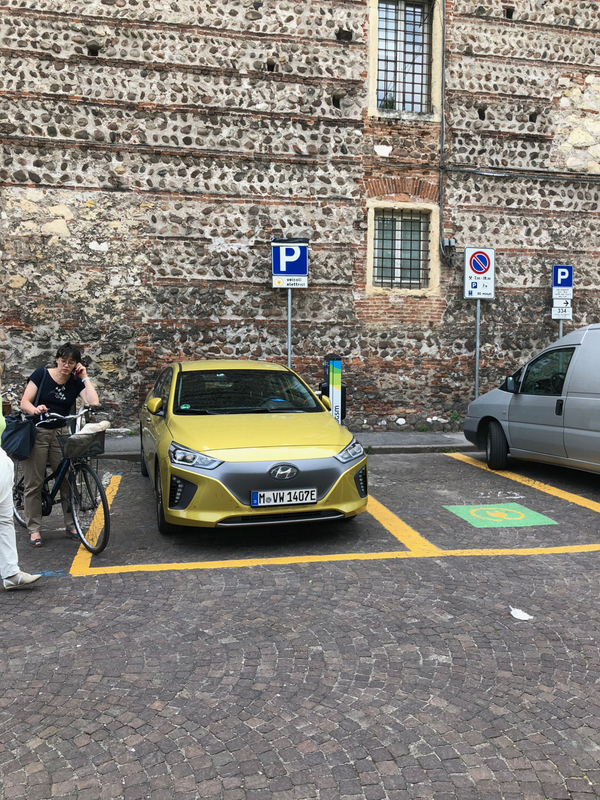 We had driven in our hybrid to Milan, an attractive city, at least in the center, and we were looking to see where the charging points were. We didn’t see many, in fact as I remember we saw 1 rapid charger and a couple of slower chargers, possibly type 3c. On the drive back to Munich, we decided that we would simulate an EV with a range of 200 Km and stop at recharging points on route. We didn’t find any rapid chargers but 1 slow charger. I think we had the New Motion charge app with us at the time but I am not 100% sure. In any case we came to the conclusion that Italy was “difficult” for charging. 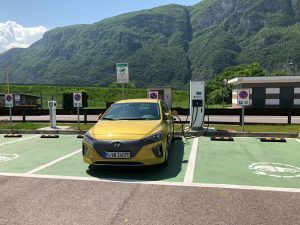 So back to the recent past and we now had our Ioniq Electric and we decided to make a tentative exploration into Italy. I had read in the GoingElectric forum of other users and trips to Italy, and one of them showed pictures of a rapid charger at the Brenner Pass. So, we decided to go there, and if possible a bit further. It was winter and therefore our range was limited. On reaching the top of the pass we drove into Brenner town, and looked without success for the charger. 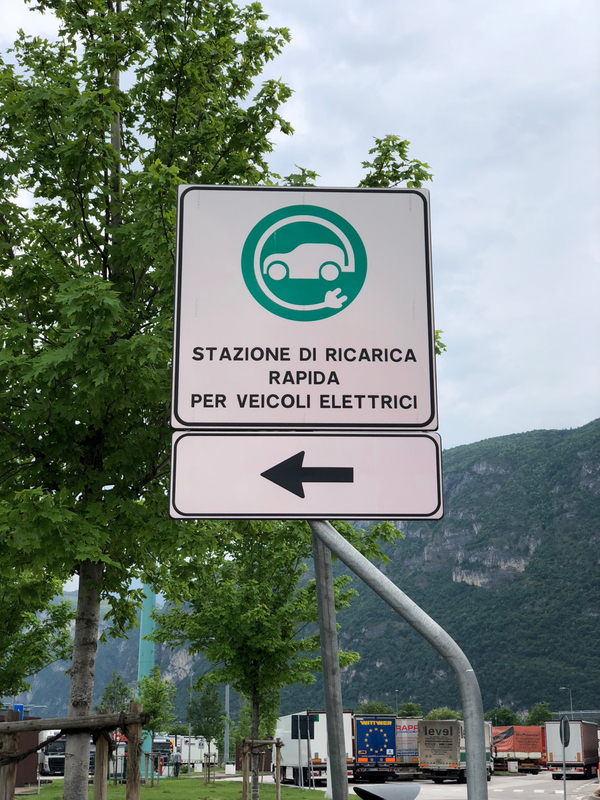 We saw a local police car, so we asked them where the EV charging was, and they said there wasn’t any but maybe in Vipitino which is about 30 Km down hill. We were at about 20% charge, so I was a bit worried about going further, but we rolled down hill without using any power, in fact we gained a bit. We found the charger, which was a 11 Kw Type 2 and for an hour whilst walking around, but I was still worried. on that charger we didn’t get much of a recharge and most of what we gained we used returning back up to Brenner. Just outside Brenner I stopped and pulled up Apple maps, put it into satellite view and manually searched for possible charging locations. It was then I spotted the Tesla superchargers outside of Brenner on the other side of the autostrada. tracing the road back I found there was a tunnel to the other side, and we only a few meters away from it. So we got our charge, and it was free. Now to the present. 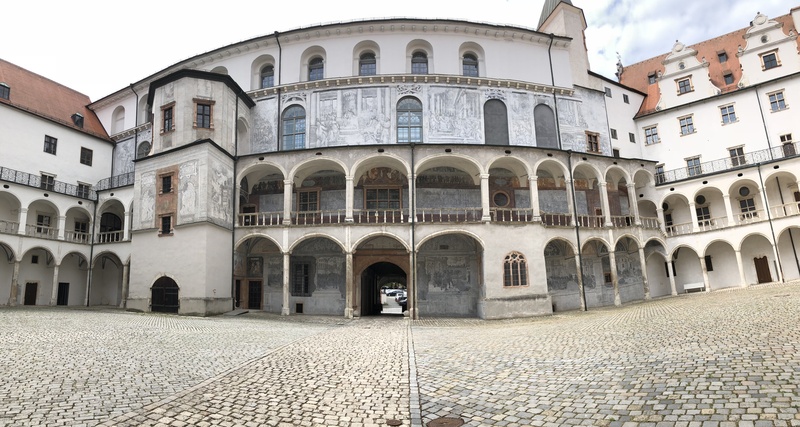 Since the first test of Italy we had been to Vipitino a few times and once from Lago di Resia to Merano and back over the Brenner without incident. So it was time to step out the comfort zone a bit more. I decided on the following strategy. I would drive to Brenner, and fully charge, then drive to the next charger that I found listed at Bolzen, or if the charge was ok Pagenella. From there to the next charger and so on in the direction of Verona, never letting the battery fall below circa 55%. If there was any issue with charging I would turn around and go back. The route went first to Hall in Tirol, to a free Lidl, where I would give a quick charge, just enough to get up the Brenner. There I charged to 94% and started downhill “into the unknown”. Downhill I needed very little power, and it made no sense to get out at Bozen, so I continued to Pagenella, and on arrival had only used 40% of the battery. The charger was free and worked perfectly. Here I have to say, not once was any charge point blocked by another car, and all chargers worked perfectly. Very impressive. The next stop was planned to be Affi, but I actually had enough power to get to the charger at Verona. Realistically I could have gone all the way from Brenner to Verona on the one charge if I had kept to circa 110 Km/h, but I did go to the autostrada limit of 130 Km/h which of course takes its tribute. 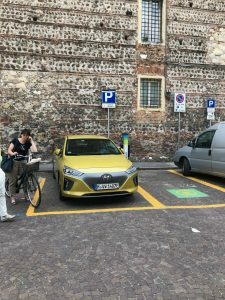 The charge point in Verona was also free, as was the parking, but had to be started with an app. I had already downloaded and installed the app, so after finding the correct QR code, the charge was easy. I stayed there about 2 hours, and then started the return trip. The return trip was, needless to say, without incident. Almost. First a quick toilet break and 10 minute top up at Affi, and then onto Pagenella. This is the only incident I experienced. It poured down with rain and there was a very close lightning strike. Luckily it only lasted about 15 minutes and during this time the temperature dropped from 27C to 15C. At Pagenella, the charger was a bit out of the way but well signposted. 20 minute or so charge up to 94% again, then up to Brenner arriving with 19% (27 Km) left. All uphill of course so high consumption. My longest charge was here. 40 minutes to reach 94% When I was almost finished a Tesla X P90 driver arrived and was very interested in the Ioniq. Surprising to me was that when I told him I get a range of up to 240 Km, he said he doesn’t get much more with his Tesla. The final part of my trip was over Garmisch to Munich, which was completed in one go arriving home with 31% (74 km) battery left. The totals were 869 Km covered in 10:45 hours of driving (plus charge breaks), average speed 86Km/h and a consumption of 13.2 kWh/100 Km. Overall I think a good day and certainly a successful trip. On a rather grey Thursday with about 19c I decided to go for a drive. I didn’t really know where to go, but I just wanted to get out for a few hours. A quick look at the map and a pin in a random town not too far away, that I hadn’t been to before. A second quick check on the ChargEV app to see what Charging was available and then off. Neuburg an der Donau was the target. It’s about an hours drive away but in the 29 years i have lived in Munich, I have never been there. The route took me first on the Autobahn direction Ingolstadt and I thought I might make a quick top up at the Tank&Rast but I decided I had enough charge to get there and back home again. As I drove by the Tank&Rast I saw that there were a large quantity of police and it looked like there was something going on, so it was probably a food idea not to stop. 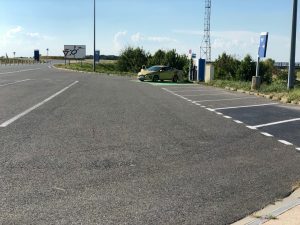 I turned of the Autobahn shortly after and drove across country via Schrobenhausen and it’s asparagus fields eventually crossing the Donau and parking at a small car park 10 minutes away from the old town. The parking was free as was the type 2 charger. The charger needs to be activated by an RFID card, I used the Maingau card. The old town of Neuburg an der Donau was very quite. It is full of historic buildings, a couple of cafes and very few stores. In this area is also the tourist information office and the theatre. 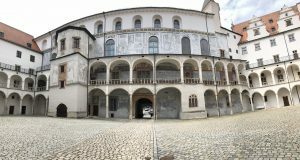 There is also the old castle which now has a museum in it. The new or lower town was not so interesting but it is where you feel M.D. most of the stores and restaurants. I must have spent a couple of hours there in total. The sun had come out and it was about 21C. Returning to the Ioniq I had about 81% charge. For the trip back I went first in the direction of Augsburg and cross country until I reached Odelzhausen where I rejoined the Autobahn back to Munich.